The Curse of Cuteness | Julie O'Neill Photography. 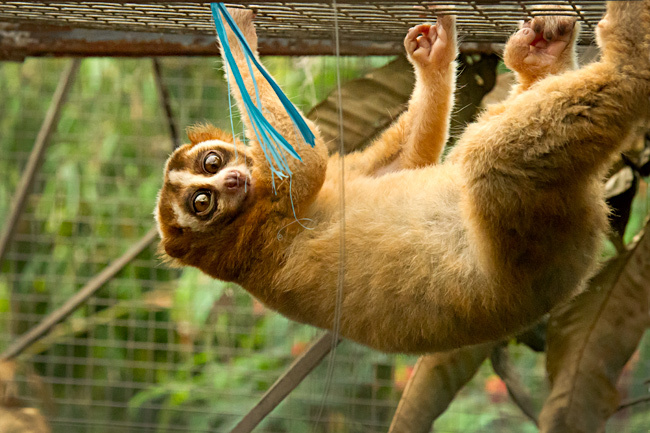 The Slow Loris is a seriously endan­gered primate that suffers from the curse of being too darn cute. Their big brown eyes and cuddly soft fur have created a demand for them as an illegal but sought after pet. Just because they are cute and soft does not mean that they want to be cuddled. 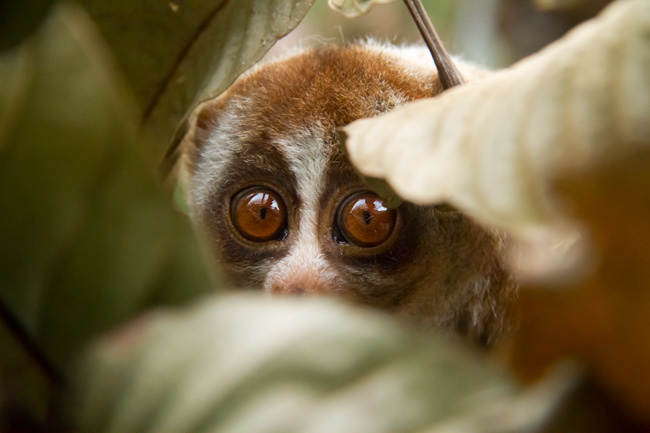 Slow Lorises are in fact, extremely shy, scared of humans and are happi­est when they are climb­ing their way through the jungle, hunting and living at peace with family members of their own species. 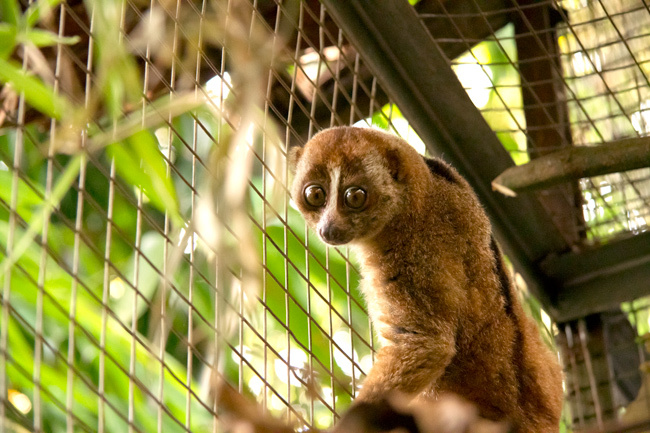 Thousands of Slow Lorises are poached from their homes within the jungles of Indone­sia each year to fill a desire that we have to take them home with us. This illegal trade has become a huge threat to the survival of the species. 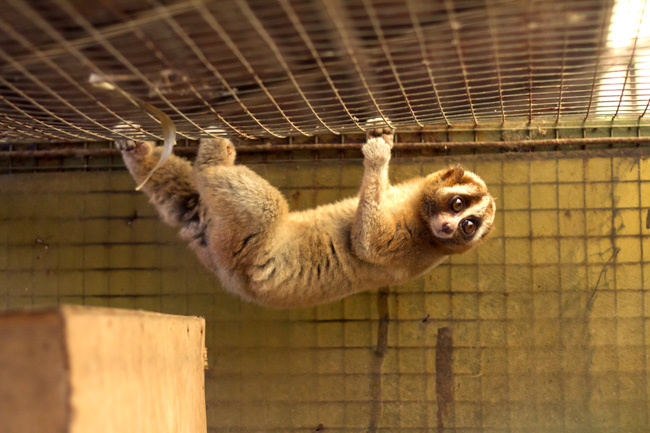 In Indone­sia Slow Lorises are sold on the streets, in markets and even within city malls although Indone­sian and Inter­na­tional laws ban their trade. 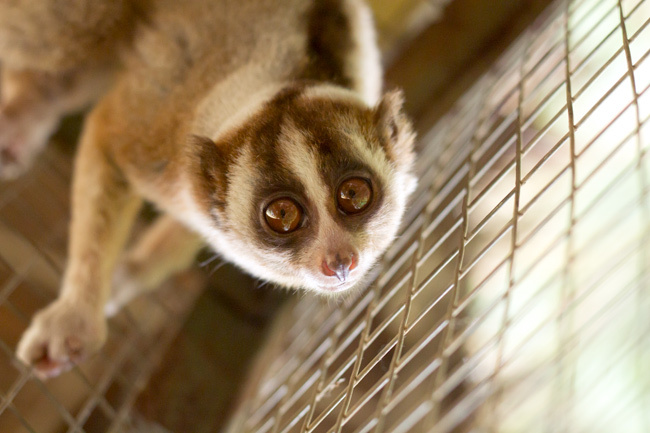 I encoun­tered several Slow Lorises at the markets in Jakarta that I wrote about in a previ­ous blog. 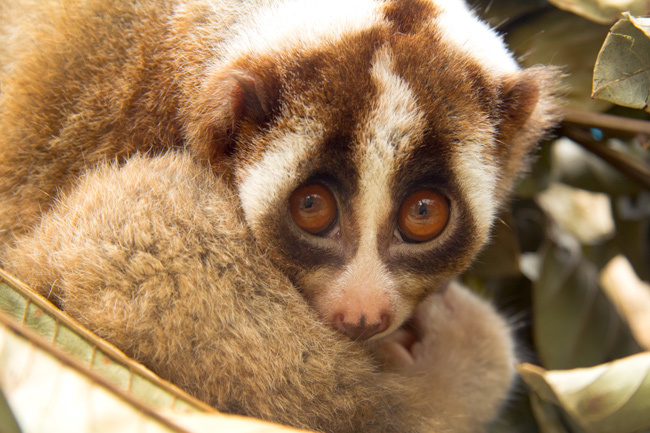 Slow Lorises are noctur­nal animals that naturally sleep during the day and are active during the night. These shy little animals suffer terri­ble stress when stolen from their homes, thrown into small cages and exposed to broad daylight. Because of their sharp and toxic bite captors often cut off their teeth causing infec­tion. Frequent infec­tion, their sensi­tive sleep­ing pattern and their specific diet make keeping them healthy in captiv­ity tricky. Many die before they have even been sold. 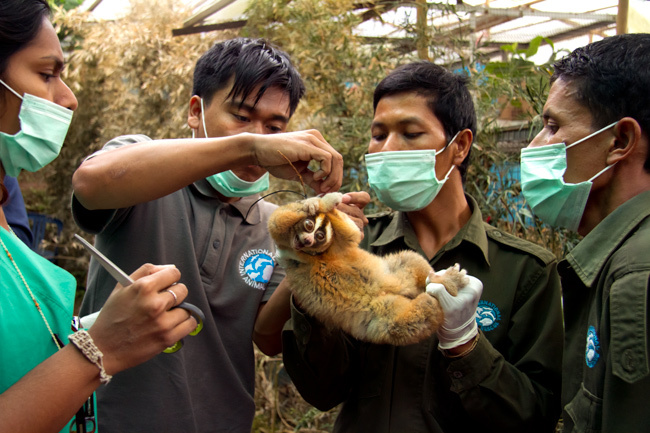 In Java, Inter­na­tional Animal Rescue is working to rescue these adorable but wild little primates. 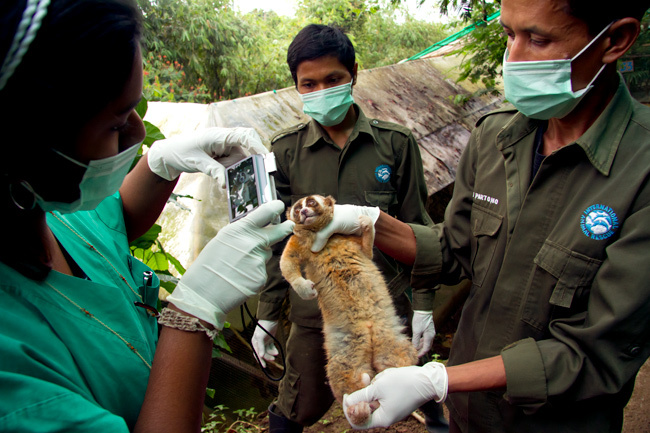 At their center in Ciapus they care for 100 Slow Loris that have either been surren­dered by owners or confis­cated from the illegal wildlife trade. Here the animals undergo medical treat­ment, rehabil­i­ta­tion and social­iza­tion in prepa­ra­tion for release back into the wild. The Slow Loris with their teeth intact are fitted with radio collars and are carefully released back into the wild under observation. 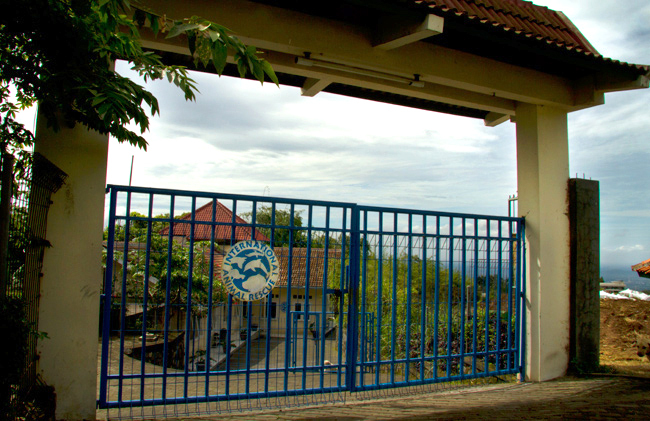 The work being done at IAR’s Java location is crucial to the survival of the species and could be their last hope. During my time at the Caipus rescue center I was once again moved by Inter­na­tional Animal Recuse’s devotion and dedica­tion to saving animals and educat­ing the public on the plight of so many animals in need. –Support the work of Inter­na­tional Animal Rescue. 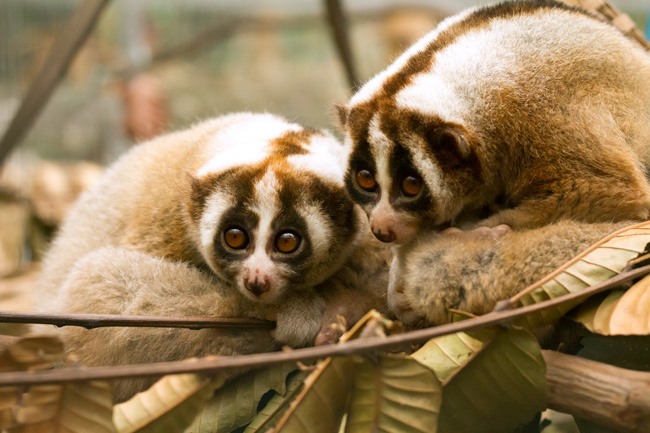 –Never keep a Slow Loris or any other primate as a pet. 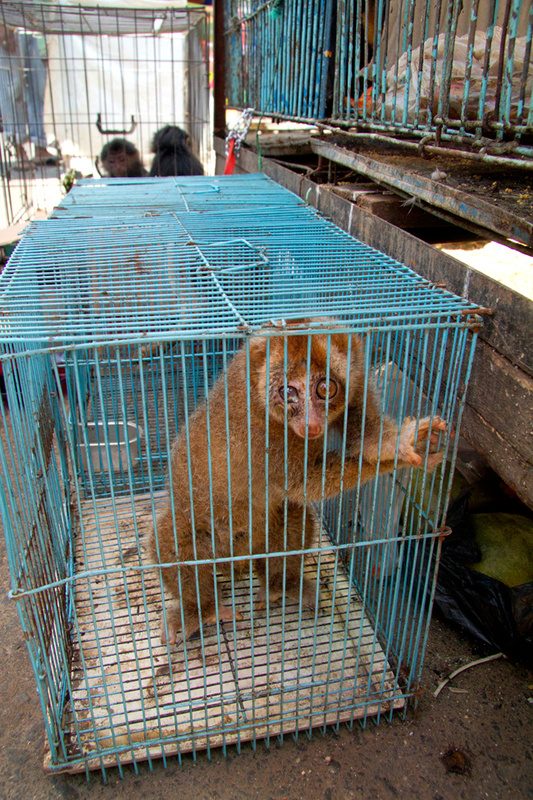 -Sign the petition asking YouTube to remove videos of captive slow lorises.